I'm totally hooked on homemade granola. It's a small effort but you have an extra breakfast/snack option all week. I add it to Açaí bowls or have it with some Oatly as a dessert or snack. I had never made chocolate granola before so I tried it for the first time last week. 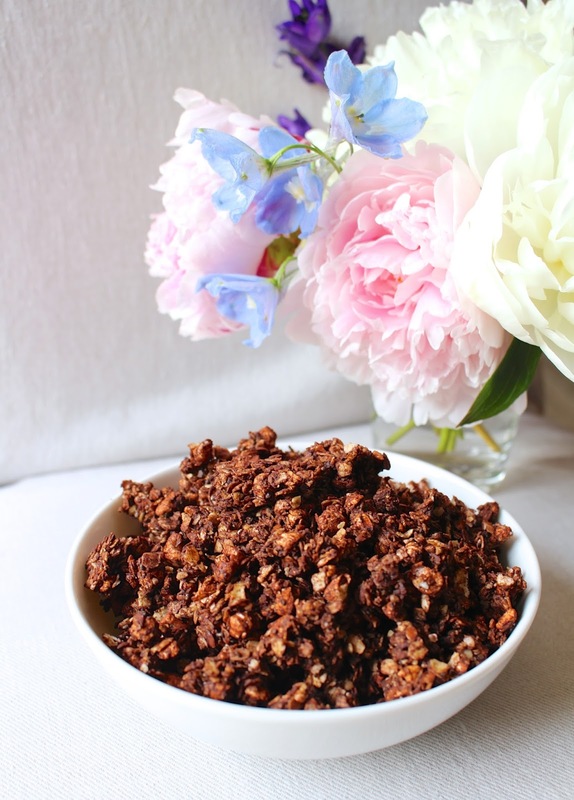 It was so good I just made it again, so I'm sharing the recipe for my choco pop granola with you too now! It's not too sweet, super chocolatey and it kind of tastes like Choco Pops, but better! And of course it's full of nutritious ingredients, so it's the perfect granola to start your day with. I used puffed Buckwheat as the puffy ingredients in this granola. You can find this at health stores. Alternatively you can use puffed quinoa or puffed rice (maybe even plain Rice Krispies, but those contain sugar already). Take out of the oven and leave to cool completely. The kitchen should now be filled with a heavenly chocolate scent, just as if you’re baking brownies but really you’re just making tomorrow’s breakfast ;) Don’t stir the granola or anything, this is how you keep it kind of chunky! When it’s cool, transfer to an airtight container. Enjoy this simply with milk (to get that real Coco Pop feel, the milk will turn into chocolate milk! ), with yoghurt or on top of an Açaí bowl, my favourite!